Yeah I know, Thanksgiving isn't a holiday celebrated everywhere. And may not be celebrated on the same day, or with the same purpose. But Thanksgiving is a holiday in America that means so much to our family. It's when we all put our busy lives on hold for a day and all come together. The older I get, the more I look forward to it. When I was a kid, it was all about the abundance of desserts that we normally couldn't get our hands on. But before we take off to "Grandpa's" house for the occasion, I want to take a moment and wish you all a wonderful day. Even if it's not Thanksgiving for you. You all have been so great, it's hard not to consider you a part of my family as well. Happy Turkey Day to you too, Lee. Ooooo dibs on the drumstick! Happy thanksgiving. By the way, as this is a canadian destro...why didn't we say happy thanksgivinglast month? Have a good time with your family and friends, American people. Don't eat too much. And happy thanksgiving for the Canadians too, one month late is better than never. And dinner is out of the way. In a few hours the grandparents come by...then supper. One of those times where family battyness gets pushed aside in favor of a halmark moment. 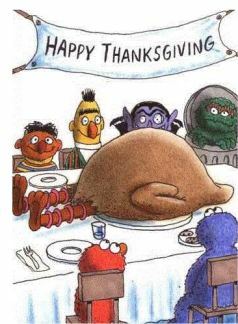 Happy Thanksgiving, and have a nice day! Also thanks for all the work you've put in our little distro.